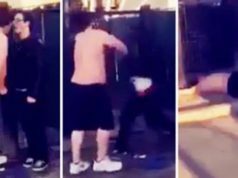 Dad Beats Up Kid Who Asked His 9 Year Old Daughter To Twerk. Then Makes Him Twerk Instead! 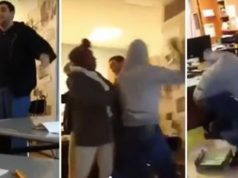 Footage has emerged which shows a viciously angry father beating up a teenager, after accusing him of asking his NINE year old daughter to twerk. And to make matters worse, he then forces the teen to twerk himself, naked, for the camera! 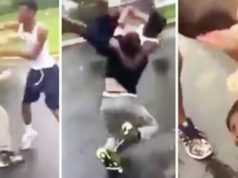 The footage, which appears to be captured on a cell phone, shows the unidentified man, stood over the boy, raining punches down on the cowering figure. 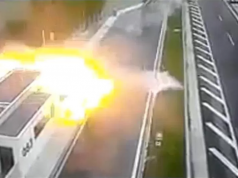 The boy repeatedly tries to say something, but the furious dad does not let him speak. Instead, he just keeps on screaming at him, and beating him. At this point, the man has decided how he will exact revenge, except for the beating of course. As he asked his daughter to twerk, he will do the same. Naked. In front of a camera. And the man’s relatives. The boy duly obliges, getting down on all fours and shaking that booty like Jenny from the block. Previous articleHas Tyrone Gone Too Far? 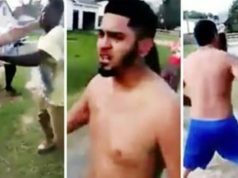 Dude Attacks Internet Star After Telling Him He’s Going To F**k His Wife!